NEW KENT – Fur coats, piles of cash, convertibles, yachts and diamond rings spun across the gambling machine’s screen. But the horses were optional. The first shipments of historical horse racing terminals were scheduled to be delivered Monday at Colonial Downs, about a month before the track’s new owners hope to open the doors of their revamped, casino-esque facility in New Kent County. To mark the occasion, Colonial Downs representatives held a demonstration showing how the machines the General Assembly legalized last year will work. The historical horse racing machines – a major step toward casino-style gambling in Virginia – will provide a critical new revenue stream to support the reopening of Colonial Downs and thoroughbred racing’s return to the track. The plan was pitched as a way to revive horse racing, create hundreds of jobs and generate tax revenue for state and local governments. But the debate in the legislature focused largely on the return of horse racing, without delving deeply into the functionality of the gambling machines or their similarity to traditional slot machines. According to an economic impact analysis circulated by Colonial Downs, the new iteration is projected to take in $203.7 million in revenue by 2022, with $161.9 million coming from historical horse racing. The machines look and feel like traditional slot machines. But instead of using random numbers, they’re powered by an archive of horse races that have already been run, combining players’ money into pools under the same pari-mutuel wagering system used in live horse racing. Monday’s game demo – just off a newly carpeted red floor lined with black bases awaiting the machines’ arrival – showed that players can pull up charts showing horse odds and jockey information and use it to carefully predict the horses’ finishing positions. Or they can just press a button over and over again and hope to get lucky. 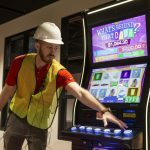 At the New Kent Rosie’s, the minimum bet per spin will be 20 cents, company representatives said, but a “high-limit” room will allow up to $15 per spin. Winners’ payouts will depend on the size of the pools, they said, and could range from $1,000 to six-figure jackpots. 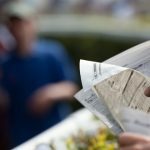 The company acknowledged most historical horse racing players would use the automatic bet feature, while more experienced horse racing fans could bet on live races or simulcast races from other tracks. The machine used for the demo featured a game-show theme called “What’s Behind That Door?,” one of about 50 game themes Colonial Downs plans to use. Other themes listed on the website of Exacta Systems, the manufacturer providing the machines to Colonial Downs, include fairies, pirates, monkeys, angels, ninjas, turtles, leprechauns and conquistadors. Still, the games are based on past horse races, even if the machine has an entirely different cartoon theme. The company has erected five billboards in Virginia to advertise the new enterprise, including one off Interstate 64 heading west out of Richmond. New OTB Opened near Washington D.C. The Maryland Jockey Club unveiled its seventh off-track betting facility with a soft opening Wednesday 9/12 at the MGM National Harbor, a luxury resort, retail, dining and entertainment venue and casino just minutes from Washington D.C. on the banks of the Potomac River in Oxon Hill, Md. The grand opening of MJC’s newest OTB facility is tentatively set for Saturday, Sept. 22, to coincide with the Fall Festival of Racing at nearby Laurel Park, a program of seven stakes worth $900,000 in purses topped by the 27th running of the $250,000 Frank J. De Francis Memorial Dash (G3). Located on the second level of the casino floor along with a 46-table poker room, the MGM OTB’s approximately 1,500-square foot simulcast facility offers 21 carrels for guests, who can also use the adjacent bar area for seating. There will be two tellers, two self-bet terminals and personal Microsoft Surface tablets available for patrons. The MGM OTB joins previous off-track locations in Maryland at the Horseshoe Casino in Baltimore, Greenmount Station in Hampstead, Maryland State Fairgrounds in Timonium, GBoone’s Events Center in Boonsboro and Hollywood Casino in Perryville, as well as the Riverboat Restaurant in Colonial Beach, Va. Filed Under: Horse Racing News, Horse Racing Promotion | Marketing, Is Horse Racing Dead, Poker Skill Tagged With: Maryland Jockey Club, otb, Virginia, Washington D.C.